A moving story of redemption and renewal unfolds in THE WORK, a remarkable vérité film that follows a group of “outsiders” into California’s Folsom Prison to join inmates in an intense four-day therapy session. THE WORK garnered the top documentary prize at this year’s South by Southwest Film Festival. The film screens at AFI DOCS on Thursday, June 15, and Saturday, June 17. AFI spoke with Jairus McLeary about the film, which he co-directed with Gethin Aldous. JM: I was one of the first civilian volunteers to be invited to the first four-day event inside Folsom. My own father invited me and although I trusted him implicitly, the weight of what I didn’t know about the inside of a maximum prison made me say no. It wasn’t until the third time he asked me that I said yes. I was floored, and that feeling never went away no matter how many times I went back. I’d done things like this before but never in a similar setting or with people so utterly committed to blunt honesty. For the convicts who lived there, that commitment was sometimes a matter of life and death. AFI: How did you find the subject(s) in your film? JM: For the three civilian volunteers that were chosen as subjects, we used word of mouth. It’s the same way any volunteer from the streets comes to one of the four-day events for the first time. my brothers I each picked a few men from our lives who were interested in doing this work and who we thought might be ready and we narrowed that selection down until we reached Charles, Brian and Chris. For the men inside, many of them knew us from over the years and the Inside Circle Foundation knew us and trusted that we were sincere and committed, so Rob Allbee [ex-prisoner and co-founder of the program] acted as a go-between. He was what’s called a brown-cardholder, which means the prison administration allows him and a handful of other men from the Foundation to participate in the convict’s weekly meetings. Rob and my father began to speak to the shot-callers of all the major gangs that participate in the group on our behalf so that we could start to put a shooting strategy together. These men are the top of the hierarchical political system inside and set the tone for the rest of the prison population on the yard. After we had their trust, they vouched for us with the other inmates we didn’t know as well. Only then did we begin to approach the prison administration with a concrete plan. 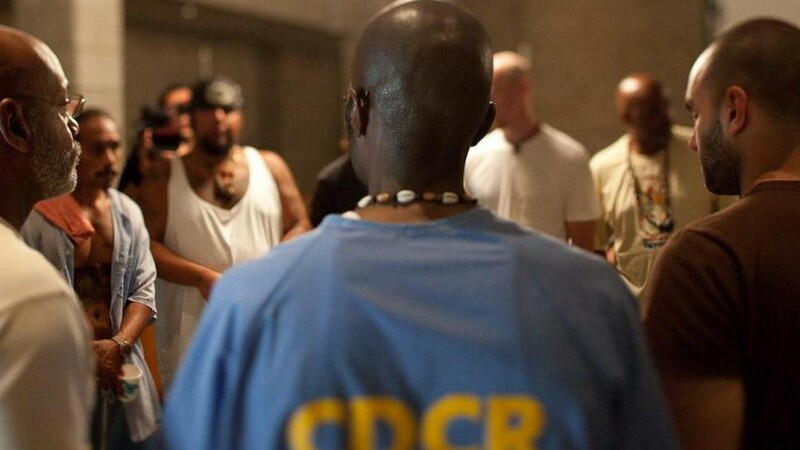 Chaplain Dennis Merino, also a founding member, worked inside the prison for years and he began to approach people within the CDCR past and present, to help us craft a proposal of our intentions so that we could then gain access to the warden. With his consent and trust earned from years of positive results with the convicts who had participated in the Program, we were able to begin to negotiate the conditions of the shoot with the proper department within the prison. With permission out of the way could set our shoot dates and concentrate on what the convicts felt comfortable with in the room on the day. They handpicked first-timers and facilitators among themselves who felt comfortable divulging personal information about themselves and doing their therapy work under shooting conditions. AFI: What was an obstacle you faced while making the film? JM: The entire crew needed to attend at least one four-day event and get a layout of the location, get to know the men in blue themselves and most importantly do some of their own personal work to gain a sensitivity that would not disturb the very thing we were hoping to capture. Only afterwards, would they give us their trust and consent. For my brothers and I, being able to reach this point with a film with these kinds of variables has been the largest undertaking of our lives. But I think the biggest success is that the men who started and continue to participate in this program somehow trusted us with their efforts and allowed us to represent what they’ve accomplished in this way. That we were somehow able to work together as a family over 10 years on this project from start to finish and come through it without killing one another and no matter the pressures involved we were able to keep our relationships intact. At each point when it was truly needed, talented, motivated people stepped up who were willing to add their talent to this project that we were somehow able to keep in motion. JM: It’s my hope that the viewer will grasp the the risks that the convicts who participate in this kind of group therapy are taking to change. The work they do together in their circles could have life or death consequences out on the yard. That’s how important this work is to them. But those who stick with the program to do this work by bring in other participants and the numbers are growing. Over time the number of convicts on the yard doing this work has grown a that such that it’s had a positive net effect on the entire yard as the rate of violent incidences decrease. Change the environment and you change the system. and continued successful program participation could be very influential with parole boards. It could mean the difference between freedom and life imprisonment – whether they are released or not. JM: Going beyond how massive this opportunity is and how amazing AFI is as a platform for our film, DC is the heart of where policy is made. It allows us the potential to gain access and exposure for the Inside Circle Foundation and for the men who keep it going. The film is about people helping one another improve by going to their darkest places together as a group. We hope that the tools these men are using inside Folsom and San Quentin will be able gain traction and spread to other prisons. America leads the world in the number of incarcerated citizens and at this point, anything that works can help that massive problem. We’re hoping to assist the program in getting the funding and support from policymakers it needs to start quantifying and tracking their rates of success with the men in the form of hard numbers with the overall goal of increasing the amount of prisons the foundation operates in. JM: Documentaries allow us to immerse ourselves in the stories of others. They can take us to places we’ve never been and they allow us to access the truth in the experiences of others. In that way, it becomes a shared experience and has the potential to generate a range of emotions; from empathy to outrage. Not only do we learn about people, places or things we didn’t have a clue about before, as we know more about them and our reactions allow us to learn more about ourselves in relation to these things outside of ourselves and our experience. Both of these are motivating forces that have the ability to galvanize people to social discourse or action and effect change. That’s what documentaries have the power to do and that goes beyond entertainment. When I look at what’s happing in the media landscape today with the rising obfuscation of truth in this country, both empathy and outrage are sorely needed.